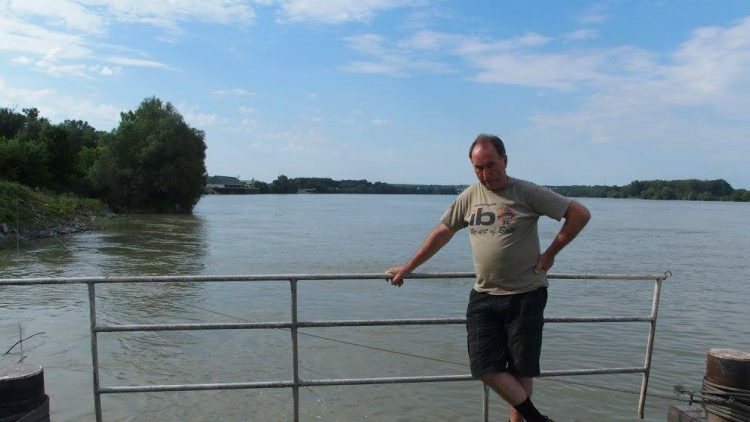 I have faithfully written blogs for every day of the voyage, but, because of very poor internet connections or none they have not been posted; now there are too many to be done at one go so I will write a brief overview of this last month and the blogs will be used as a basis of the forth coming book of the voyage. I know many people have been keeping up with the progress of the voyage and I am sorry I have not organised communications better which is also an important part of the voyage? The month has been a whirlwind of events and meeting people, battling with the weather and officials alike and having a lot of fun. Am to catch up with this blog and do some internet stuff. I loaded up some phots and ran out of time so did not down load my videos from the last few days. I went off to the marina, where I had been told to go by the policemen who had told me about the free beer. I called into the police station on the way to make sure this was the correct destination to start the procedure; apparently it was so I went there with more expectation of getting my passport stamped. A chatty bright blonde person greeted me and told me I was basically in trouble. The words I have heard so often came very easily to her in very good English; ‘the problem is’. The morning came bright and hot. Feeling sick and wobbly, I felt as though I had a Halloween plastic mask on my face. I got up and drank a litre of orange juice, tended to my wounds and bites and had coffee. I used the internet until my man turned up half an hour late. After I bought him coffee in the restaurant I set off to visit to the town. 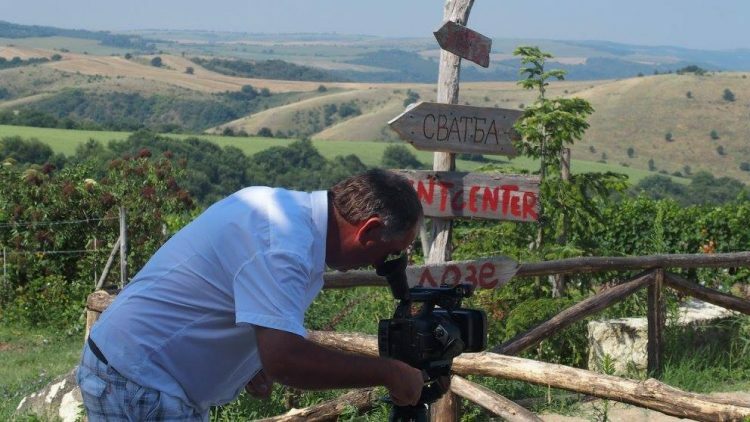 I made an investigation of where to go to get papers signed, filmed around the centre, had a huge burger like dollop of food, served by two enthusiastic women who could not speak anything other than Serbian. It was a beautiful morning. I went off to get supplies and petrol and got back to find there was an international power boat race underway on the river which was closed to all traffic for the day. I had a good breakfast and discovered that there would be an opportunity to leave at lunch time, between 12pm to 1pm. So another late start. I went down to the pontoon to see yet more snakes patrolling around the Banana, making certain any thoughts I had of having a quick dip before setting off were cancelled, permanantely. I went to building site early waited for the builder who arranged the meeting with the outboard moer salesperson and got his phone number. 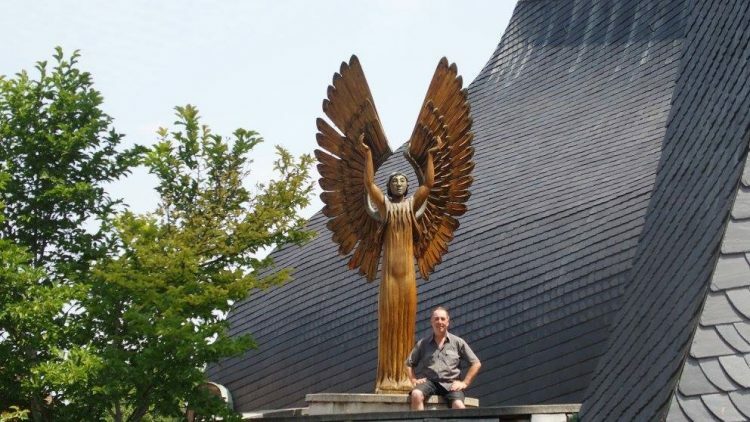 The builder phoned him for me. The guy said he was busy and would sort it on Monday – I pointed out that I would be leaving today and would leave the outboard with the police, buy another outboard and return for my money when my trip was over in a few months’ time. I got his address and went to his house. Same story about Monday, but when his wife saw me filming she phoned and he came. He was doing his week-end job and was not messing me around. He offered to give my money back when he realised the motor was actually broken and was not my fault. I bought the motor he used for his own boat, an almost unused Suzuki 5hp; lighter, more reliable and more than twice the price. I weighed the cost of looking for another motor plus more delay and bought the outboard. 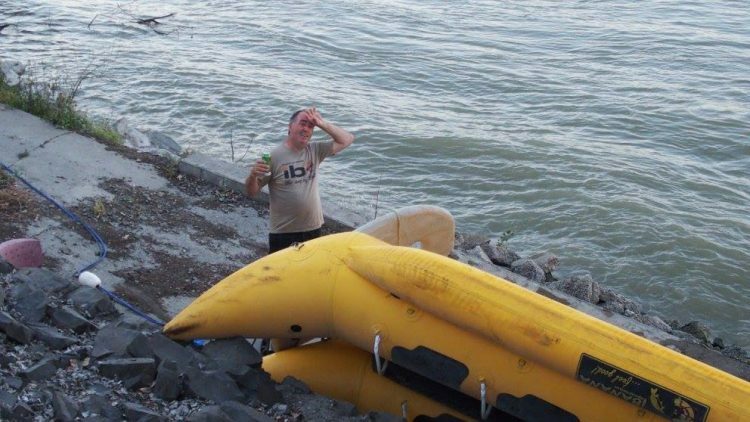 Last night, after successfully constructing the platform to hold the outboard motor I decided to give the Banana a test run before leaving this morning. 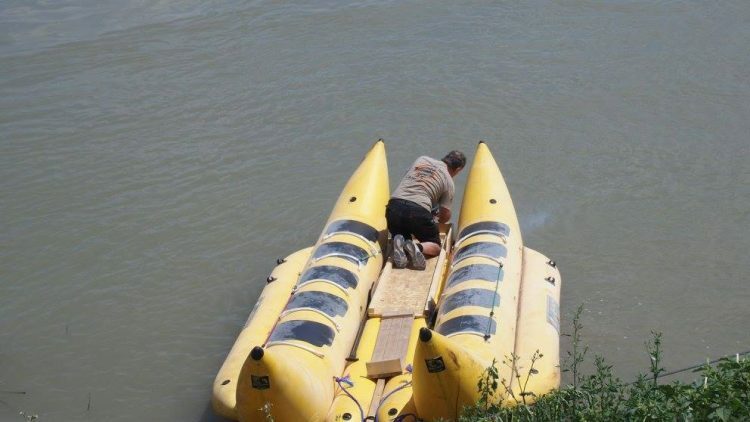 As I moved the Banana down the slipway a half metre long snake swam slowly from underneath and disappeared from view. Before doing anything else the Banana was inspected for any close relations that may have come around to visit their friend who was under the Banana. Tuesday through to today, I searched the locality for a solution to the lack of ships willing or otherwise to take the Banana away. This involved a catalogue of travelling around the town looking for inspiration for a way out of Paks. 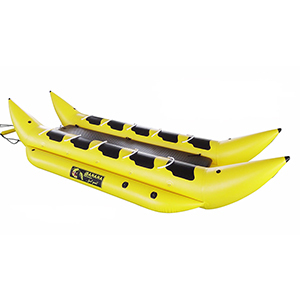 This search went from the ridiculous impractical ideas of various ways the Banana could be propelled or towed. 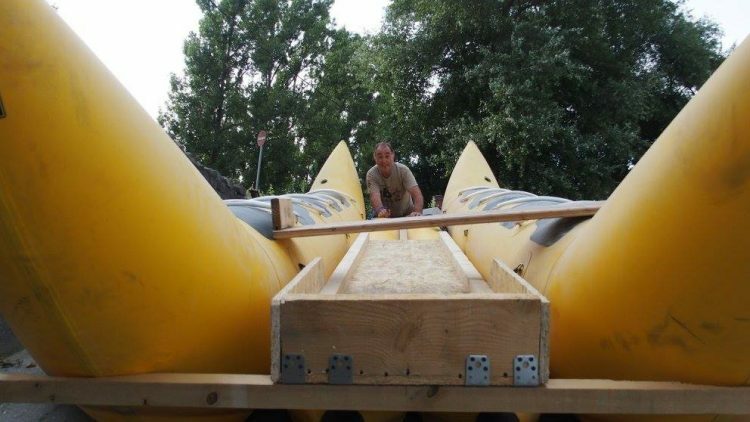 I saw the possibilities of borrowing or buying a boat and towing the Banana, or adapting it to have pedals, oars or even a sail added. 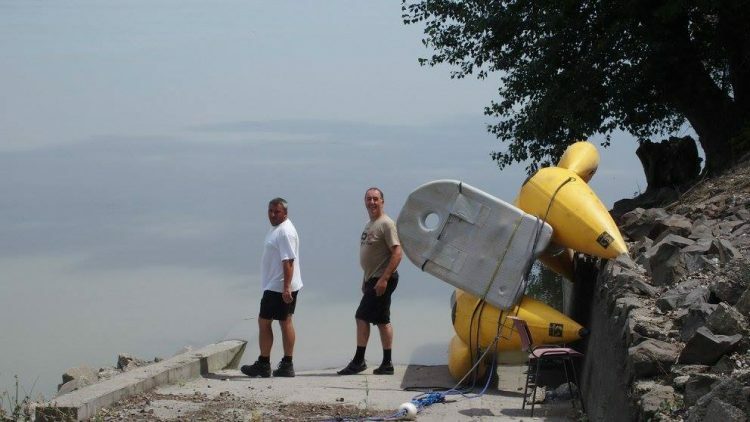 One look at Google maps, the river itself and calculated the distances involved it all came down to either a boat with an engine or a Banana with an engine. I did not abandon the attempt to find a lift so I returned frequently to the quay, to talk to the captains who were going the wrong way but may help with the inside information they have. The ship, Hong Konig I travelled with over the Main Danube canal is owned by the nephew of the captain who was in the port until Wednesday; the tight community of people on the river know more about what is really going on than any outside observer will see. Time for action. After breakfast I drove into the town and methodically drove around all the industrial buildings it had to offer. There is a good amount of small businesses, wholesalers, buiding supplies, garage and small industrial units. My problem was that I had to stop and go inside to find out what activity there was going on inside. The usual clues such as signs were useless to be. Very few had anything I recognised so simply had to stop, park and go and have a look. On one small set of factory units and workshops I stopped and was asked what I was looking for. 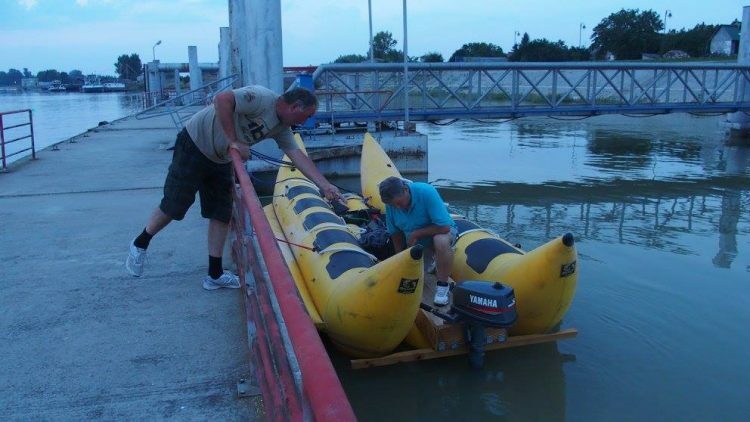 This was a mistake to get involved in trying to explain that I had a Banana which needed modifying to have a keel and outboard motor fixed to it. 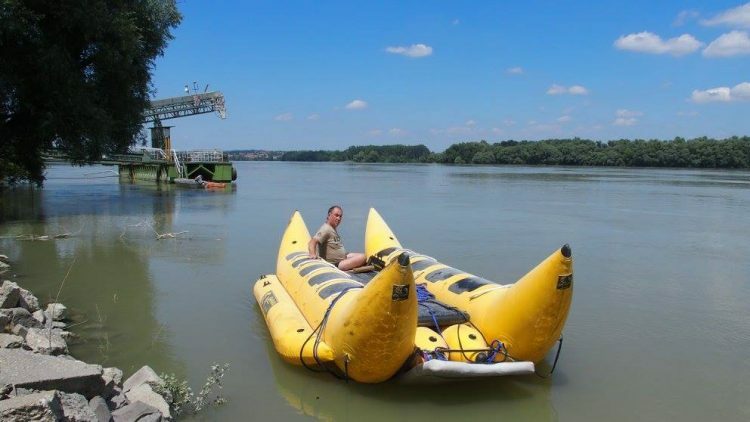 Making a gesture to describe a Banana shape, then miming an outboard motor, including engine noise impressions, whilst pretending to sit on an imaginary boat being driven forward in the river left most of them dumbfounded, and just a little worried about their peronal safety. The week-end is upon me, and for me this is not good news. The port will function to fill the ships that are here, but nothing else is planned, and there will be no more ships until Monday. All is well, no panic and no stress, ships are coming and just because the ones that have been here are all going towards the West (physically North on this stretch of the river) towards Budapest and those who could have taken me East wouldn’t for a variety of reasons I don’t understand. Like I said, no stress. I decided to use the day to chill just a little, read a little and do some basic stuff like shopping, clean things and catch up on internet messages and write notes. Denize pringle on Arrived in Rotterdam today! Go Banana - only 3.200 km to go!